Instead of the user entering a tempo value by hand, it’s possible to have the computer measure the tempo at which the user is tapping the beat. Do do that, you simply need to measure the time difference between two events (taps). 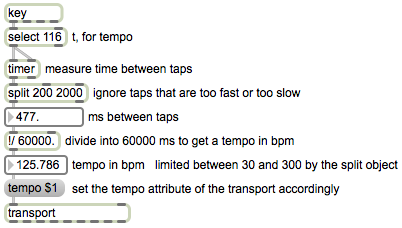 In this example, I use the ‘t’ key of the computer keyboard (t for tempo, or for tap) to set the tempo attribute of the transport. The timer object measures the time between a bang in its left inlet and a bang in its right inlet. Note that, because of the right-to-eft message-order rules of Max, a bang to both inlets of timer coming from the same outlet of another object will first go to timer‘s right inlet, sending out the time since the previous bang in the left inlet, and only then will it go to timer‘s left inlet to serve as the starting event for the next interval to be timed. Thus each bang message triggered by the ‘t’ key will serve as both the ending event for one time interval measurement and the starting event for the next time interval measurement. This tap tempo patch allows the user to set the tempo as quickly as possible, with just two taps. There are a couple potential downsides of this quickness, however. One is that the tempo leaps immediately to a new rate with each tap, which could possibly result in some jarring changes. The other is that the user must tap at precisely the right tempo on the first try, or else must keep re-tapping till the right tempo is achieved. A possible method of addressing those potential problems might be to take the average of a few successive taps, thus leading to a slightly more gradual (but still pretty efficient) change to a new tempo. That approach is demonstrated in a tap tempo example from a previous class. This entry was posted in Example by Christopher Dobrian. Bookmark the permalink.